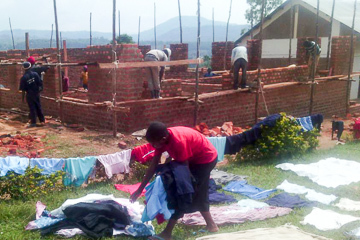 Building the High School meets an important need in the area for a high-quality secondary education for pupils leaving primary schools around Kanungu. 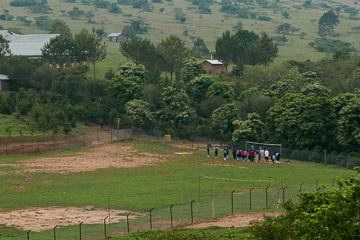 Six years ago, it was just a field. 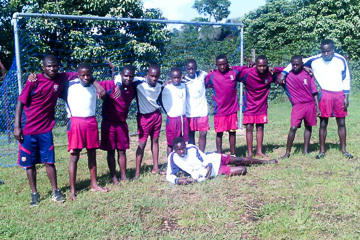 Fundraising by Highgate School in London provided money to build two classrooms and the admin block so the school could open and first year group be recruited. 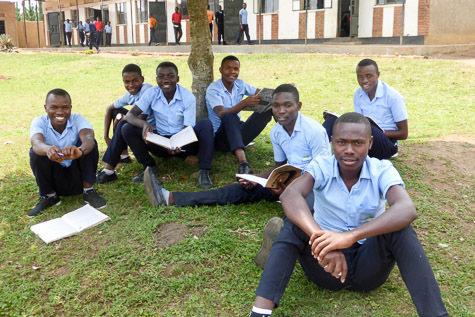 Each year, the pupils move up the school and another year group joins, so more funds were needed for the next classroom, dormitory, laboratory, library, staff house etc. The school now has all year groups and the first cohort have achieved their “A” levels, some moving on to Great Lakes University. Teaching starts broadly but, for senior pupils, is focused on subjects which will be of most use to them, for employment, and to the community. This leads to a bias towards scientific subjects. Creating a new school from scratch was quite a challenge. It is a great achievement which is already changing the lives of the boys and girls who spend their important teenage years there and will enable them as adults to have a real impact on the entire community. The second science lab is now complete anhd fully in use. This means the High School has sufficient capacity to teach practical science to all the year groups. The labs will be used for 'O' and 'A' level practical exams in November 2018. 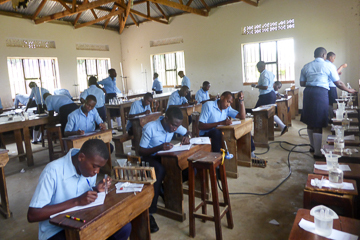 This high-quality science teaching is a really important initiative in rural Uganda as it helps students (and the wider community they later work with) understand the world from an evidence-based perspective. Thank you to Highgate School families and everybody who contributed to making this possible. you think and you say. gift to all the world. the depth of your soul. The sports pitch which was opened last year is now fully in use. Grass has grown over much of the rough ground (making it less hazardous to play football in bare feet!) and the goal posts have been installed. The High School is delighted with its end of 2017 'A' and 'O' level exam results. Work has started on constructing the second science lab. It is important that students get a good grounding in science as this understanding is in short supply in the region. The first lab is fully utilised by the older students and this facility gives younger pupils the chance to carry out practical experiments and build their understanding of physics, chemistry and biology. The new water supply is complete, with a yield of around 2 litres per minute. Multiple underground springs spread over a 400 m2 area were consolidated to feed into one box where the water is filtered. From the box it is fed into a waterproof stone tank and left to balance its pressure for the long journey - 7km by underground pipe to the school. Most of the piping was relocated from the old spring which dried up following a prolonged drought (which has also caused a food shortage in the region). It is a relief to have enough water for drinking, cooking and washing. Water project: the school depends on a spring 5km away for water for drinking, cooking and washing. A two-year drought has devastated harvests and dried up the old spring. The money raised will pay to open up a new spring 7km from the school and relocate & extend the existing piping. School truck: the existing truck was old when purchased and is now end of life. The replacement second-hand truck was delivered in November, bringing the first batch of water pipes from Kampala. It is needed daily to transport students, food, water and equipment, so a more reliable replacement will be much appreciated. The school has 300 boys and girls with 24 teaching staff. It is a boarding school in lovely countryside around a mile from the nearest village. The pupils come from many local primary schools and stay up to “O” or “A” level. We are monitoring the next steps for recent leavers and the results are encouraging. Meeting the children is a delight. They are clearly happy and engaged in learning and the many other activities at the school (football, volleyball, netball, debating, drama and scouting for boys). 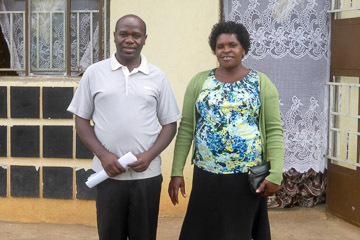 Naboth and his wife Jackie we appointed head and deputy head in January 2017. 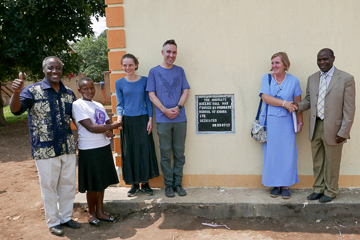 They are pictured above in front of staff accommodation for eight teachers (which was recently built to enable us to recruit a high calibre of staff). Naboth shows great commitment to the school; his determined character is already making a difference to the quality of education provided. Some basics we take for granted remain difficult at the High School. Water: the drought has dried up water sources we previously relied on so drinking water must be fetched in the school truck. Electricity: the mains connection is not yet live so there is limited power for revision in the evenings and for using the IT library; the generator is expensive and solar panels have limited battery capacity. The new sixth form girls’ and boys’ are now complete and in use. The senior pupils are excited at living in a less overcrowded space. The photo shows the opening ceremony during the visit by Highgate School pupils. 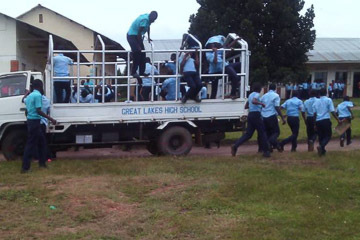 Great Lakes High School teaches science subject up to “A” as these are important both for pupil’s future employment and for their contribution to the development of the community. New science laboratory equipment has been recently installed and more is required for other year groups. 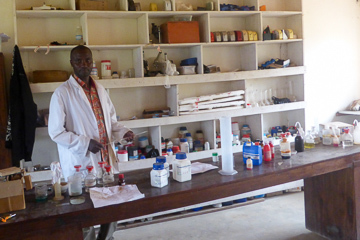 Consumables such as chemicals for practical experiments are an ongoing expense which is significant in Uganda. 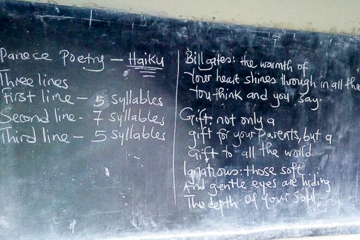 This year both Highgate School and Hull Collegiate School visited Kanungu from the UK. These visits are hugely valuable for everybody concerned. The UK pupils get to understand something of life in Uganda which, for some, puts details of their life at home in perspective. 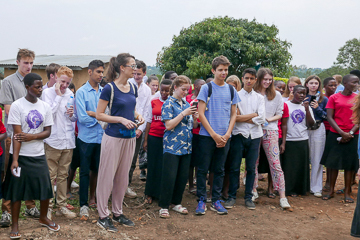 The Uganda pupils get the opportunity to talk to people of their own age from the wider world, giving an insight into what they may be part of later in life. And, just as important, everybody really enjoys the visits. The new sports pitch has been levelled, fenced and the largest stones have been removed. It now needs a chance for grass to grow over the rough ground to make it fully usable. Great Lakes Highgate School vs. Highgate School results: GLHS won the football and Highgate won the netball, so honours even! 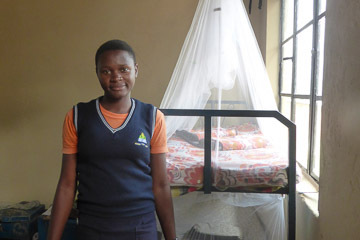 The mosquito nets, funded by Hull Collegiate School, have been installed in the dormitories so every child has a new net. This is important as malaria is a major issue in the region. As well as avoiding the children getting sick while at school, use of nets sets habits for life and encourages their families to use them at home. Duncan, a former pupil at the High School, has published a book «Making Right Choices». 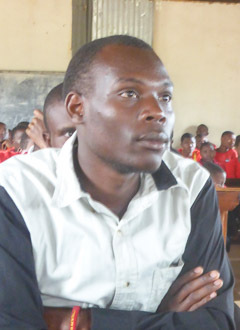 He was one of the first pupils, joining the school in 2008 when it only offered “O” levels, so he completed his schooling at San Gionvanni Secondary School and then graduated in environmental science at Makerere University. He lives with his aunt and financially supports his brother (having to sell his motorcycle to pay towards his brother’s education). He is setting up a local project to support unemployed young people to set up enterprises. All this has been made possible by the generosity of the sponsors, who pay for the monthly running costs, and donors, who pay for the individual small and large projects which are building this new school. Truck: the school truck, needed to collect water, food and firewood as well as school outings, is at end of life and needs replacing. Science lab: the school focuses on science but one lab is only enough for older children; a second lab is required to ensure that all year groups get important practical science education. 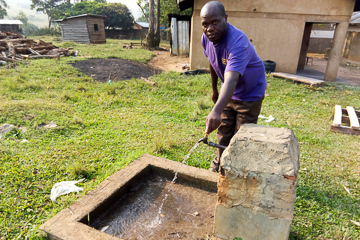 Water: despite piping to a new water source and installing rainwater collection, the drought means that most days drinking water must be collected by the truck. We are investigating relocating the piping to a more consistent source 13km away. Solar batteries: solar provides power for the IT lab and for a short time in the dormitories in the evening, but batteries degrade after three years and replacements are due. Mosquito nets: the new nets are in good condition but we must budget to replace them each year. Our main funding comes from sponsors who pay £15 each month per pupil. 120 children currently have no sponsor. The families also make a contribution. There is a “hardship fund” for 40 children, mostly orphans, who pay no fees. 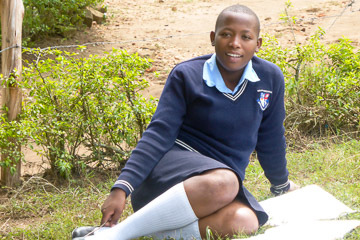 For just £15 per month, you can ensure a child gains an education. We will send you regular newsletters and, once a year, a letter from your sponsored child with their photo…so you can see what a difference you are making. 100% of your sponsorship & donations go to the schools, none of it is spent on UK marketing or admin.